Frederick DuCane Godman (1834-1919) was an English naturalist who was a member of the Royal Society and a trustee of the British Museum. His wealthy family background allowed him to travel the world, and the spoils of one of those travels ended up linking his name to the jewel collection of Queen Elizabeth II. 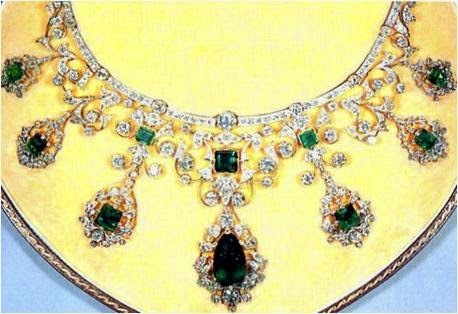 In a tale told by Leslie Field in The Queen's Jewels, while on holiday in Bavaria in the 1890s, Godman purchased this magnificent diamond and emerald necklace. The piece has seven pendants, each with a central emerald in a scrolling diamond surround, hanging from a foliate diamond base studded with three additional emeralds. The original story of the necklace's provenance tied it to Empress Joséphine, first wife of Napoleon I. Joséphine's son, Eugène de Beauharnais, married Princess Augusta of Bavaria and settled there after Napoleon's downfall, so it was not out of the question that one of her jewels would end up in Bavaria. Godman gave the necklace to his two daughters, Eva Mary and Catherine Edith, and in 1965, they decided that they might like The Queen to have it. They wrote to the Lord Chamberlain and told him they had a piece of jewelry that might be of interest due to its possible provenance, and the palace sent the Surveyor of the Queen's Works of Art to check it out. A thorough investigation turned up no evidence to validate the ties to Empress Joséphine, but the Godman sisters still wanted to give their gift and The Queen liked the necklace enough to accept. It is rare for her to accept gifts in this fashion, but apparently an exception can be made for something this extraordinary. It certainly is an eye-catching piece; I receive more requests for information on this necklace than just about any other item in Her Majesty's jewel vault. The sisters were thanked in a private audience and The Queen has fulfilled their one request, that she wear the piece occasionally. The connection to Empress Joséphine may have been false, but the necklace has been used for some French events, such as a dinner during the 1984 French state visit, and a banquet at Windsor Castle to celebrate the centenary of the Entente Cordiale in 2004. That banquet was filmed for the documentary Windsor Castle: A Royal Year (a clip can be seen here), and the sparkle of these diamonds and emeralds is truly spectacular. I believe that was the last time the necklace was seen in public.